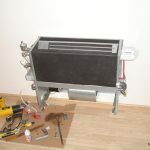 I ordered a 120L non-corrosive steel hot water tank with two heat exchangers in it – one will be used for the refrigerant and the other is a spare one, I plan to have a fireplace connected to the water system at some point in time and will hook that to the water tank as well. The heat exchangers have been carefully designed with the help of local forum gurus. The indoor heat exchanger of the air conditioner is replaced with a brazed plate steel heat exchanger. The electronics from the unit is extracted and used to control the system. 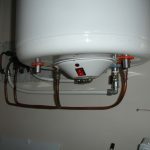 The air temperature thermistor is trimmed with extra resistor, to accommodate for the expected lower temperature of the fluid compared to the original design with air and placed on the returning cold water outlet of the brazed plate heat exchanger.The original indoor unit tube thermistor is placed unmodified in the middle of the brazed plate heat exchanger. That setup provides me a 120L of domestic hot water regardless of the operating mode, heating or cooling. I have invested extra efforts to make sure the house is overly well insulated to accommodate for the low-temp heat pump setup I have in place. 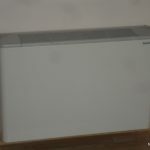 The heat pump I used is a Daikin FTX71GV / RX71GV. Needless to say that all warranties are voided, but worth the risk. To monitor the heat pump and provide some controls have created a special Arduino-based system that I will be describing in a post to follow. I use the system for a second year now and am extremely pleased with the results. My electricity bill is ridiculously low for what I get. Thanks for sharing! I realized you used the tank hydraulic tube heat exchanger to do the heat transfer. Haven’t you had any problems with leaks? I’m asking this because generally these tube heat exchangers are sized to pressures like 10bar, while you will get probably higher pressures when using refrigerant. Do you have any additional info you can share concerning heat exchanger design? I am really interested on this. this is no ordinary water tank, it was custom-ordered with two heat exchangers inside: one is for the refrigerant, smaller diameter stainless steel tubes, and the other is reserved for a fireplace with water jacket. So it can handle the pressures with no problem, we tested with 2x the maximum pressure. I am no expert in this area and had an heat-pump expert make the specification and calculations to the hot water tank factory (tube length, diameter etc). The custom water tank cost me ~450 Euro, it is 120 l but if I were to do this again, I’d go for larger volume. Have you done any testing yet with flow temperatures and electricicty consumption to calculate the COP (coefficient of performance) your getting? Where were you two months ago! 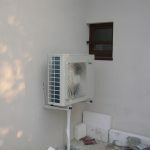 I’ve been battling with finding a cost effective solution for an air-to-water heat pump for the the past 6 months. I’m in the US (west coast, Oregon state) and have an all electric home. I have all radiant hydronic heat (low temp in slab basement and mid temp staple up between the joists). 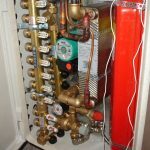 I would love to capture the efficiency of heat pump technology to make all the hot water for my hydronic heating and domestic hot water load. 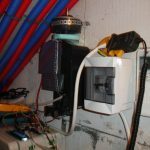 I hooked up an electric boiler for the time being but want to copy your hack! 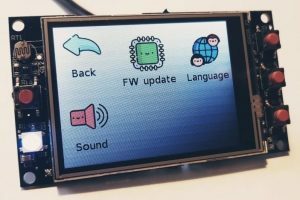 Can you point me to the forum you mention that assisted with this beautifully simple and ingenious hack? These took months to complete, but totally worth it. Can you please tell me what type of refrigerant-to-water heat exchanger you used and where you got it? Or at least some of its technical characteristics? I’m interested in a similar hack but for a smaller 2.5 kW unit and mainly to use it as an air-to-water chiller. Mine is a ‘KAORI SR-B3-23/60’, but it is an old model that I don’t find on the manufacturer’s site any more. It has area 1.38m2 and is high pressure; Got it from a local shop.